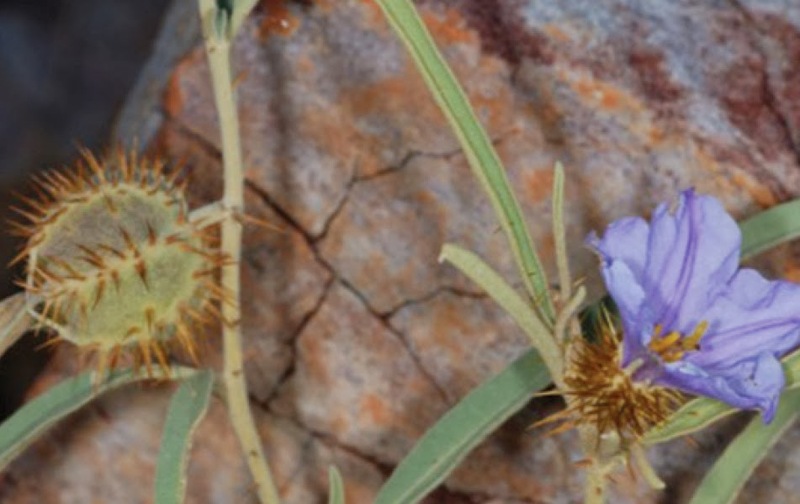 "I was certain it was something new when I saw it," says Chris Martine of the bush tomato species he discovered in the Australian outback. It's a scrappy, spiny shrub with crinkly purple flowers that thrives on fire. It also uses treachery to survive, disguising its female flowers with fake male parts and even fake pollen. A botanist and biodiversity scientist at Bucknell University, Martine explains that the new plant "was on the radar of a few local botanists as being an oddball." Martine had been studying related species for a decade, so when his lab analyzed this plant's DNA, he recognized that it was something different. He went to Australia to document the species in person and dubbed it Solanum cowiei after botanist Ian Cowie at the Northern Territory Herbarium, who first introduced him to the plant. The diverse Solanum genus includes plants ranging from potatoes and tomatoes to eggplant and nightshade. The Australian bush tomatoes that Martine studies grow little fruits that can be edible or quite poisonous, depending on the species. Martine discovered that compared to its relatives, S. cowiei is especially well adapted to the fires that sometimes sweep through its habitat. The plants live in large groups of clones tied together by underground root systems. In an area that had recently been burned clear, Martine found S. cowiei plants springing up and blooming while other species lagged behind. This means that after a fire, these plants have a competitive edge over all their neighbors in getting to pollinators. The new species's method of reaching those pollinators is a weird one. S. cowiei grows separate male and female flowers, and like about a dozen of its close relatives, it disguises the female flowers with fake male parts and pollen. Under an electron microscope, the false pollen grains look like brand-new tennis balls. Real pollen grains are closer to old ping-pong balls, with large dents or grooves on their surface—these are the weak spots where a narrow tube may later burst out of the wall of the pollen grain, carrying the plant's sperm to an egg. Why bother with the ruse? Solanum flowers don't have any attractive fragrance to lure their pollinators, or nectar for insects or birds to drink while they're dusted with pollen. Instead, these plants rely on pollinators that want to eat the pollen itself. Certain foraging bees use pollen to feed their young, Martine says. "So if you want one of these bees to visit your flowers, you have to have to have the visual cue of the anthers," a flower's male parts. "And if you want them to come back to flowers like yours again, you have to give them some reward to take away." Martine and his collaborators are now studying whether this fake pollen is any better or worse for young bees to eat than the real stuff. "Is there a difference in what they are getting?" he says. "Can they tell?" The "oddball" bush tomato isn't the only plant Martine finds intriguing. He produces an online video series called "Plants Are Cool, Too!" ("Can an animal make its own food? No! Can an animal feed the whole world? No!" the theme song declares.) Martine started this series after working with kids who were interested in science and realizing that they knew a lot about animals, but not so much about plants. People browsing online are more likely to encounter a cute cat video, after all, than one about cattails. So he started putting together episodes that highlight some of the "coolest" plants, along with the botanists who study them. The next full episode should be out in January, he says, and it includes an especially cool moment: a new species of mustard plant being discovered. "Our guest expert looked down during shooting and said, 'Hey, wait a minute,'" he says. "I don't know how often new species are discovered while a camera is running, but it can't be very common."